Be sure to pre-order your copy of the THE FURY OF FIRESTORM: THE NUCLEAR MEN VOL. 1 – THE GOD PARTICLE trade paperback! Most local comic book shops will be placing their orders for this collection with their distributors within the next few days. Don’t miss the chance to pre-order this trade paperback! Even if you already have the issues, order a copy of this trade! Let’s send a clear message to DC that we’ll support Firestorm comics in trade paperback format! Order today! 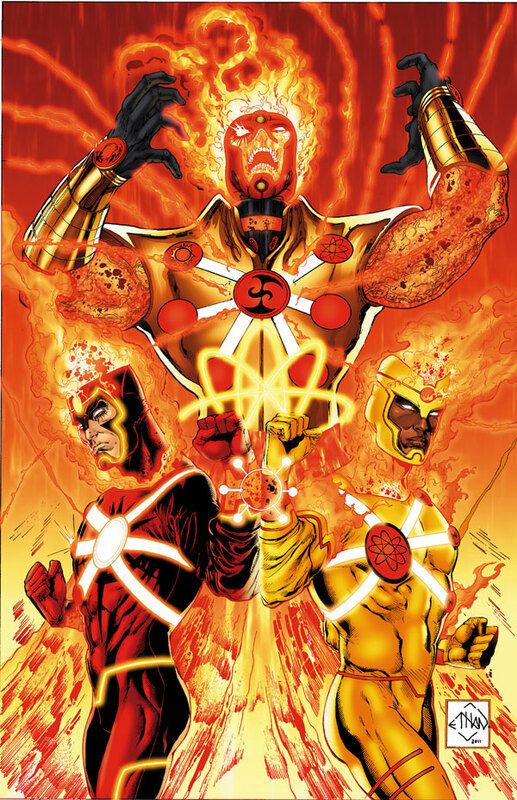 Two FIRESTORMS make their explosive returns in the DC COMICS – THE NEW 52 series! • As RONNIE RAYMOND and JASON RUSCH learn to work together, they learn that they are hardly the only FIRESTORMS! • Collecting THE FURY OF FIRESTORM: THE NUCLEAR MEN #1-6! Posted in: Comic books, Ethan Van Sciver, Firestorm #09: New 52 v1 (Firestorm Protocols), Firestorm comic vol. IV, Gail Simone, Norm Rapmund, Yildiray Cinar. I really wish that DC would add extra content, like character sketches and stuff like Ethan van Sciver’s original pitch for the series etc.